Within the context of this firm-wide transition, impacting our offices in London and Shanghai, as well as in the domestic US, and considering an economy still very much in flux, we asked ourselves the following question. What really constitutes quality construction documentation? Our answer is quality architectural documentation of a building comes from being able to describe complexity in the simplest way possible. The AutoCAD to Revit transition also meant a HLW mindset transition corresponding with the shift from traditional drafting to three-dimensional modeling. A change in tools necessitates a change in mindset. The new process is about building a three-dimensional model with unlimited views. 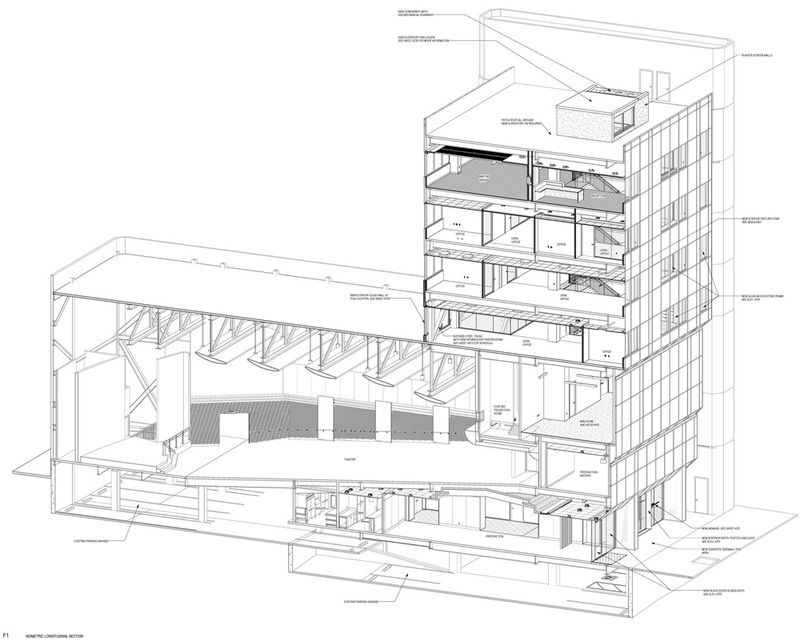 Plans, sections, elevations, isometrics, and perspectives all represent different views of the model. The more accurate that the model is drawn, the more effective and precise it is in creating all the necessary views to describe the building to the General Contractor. In effect, a more sophisticated tool has resulted in a much more elegant and simplified process—one with the capacity to leverage the three-dimensional aspects of Revit toward simplifying the overall complexity. 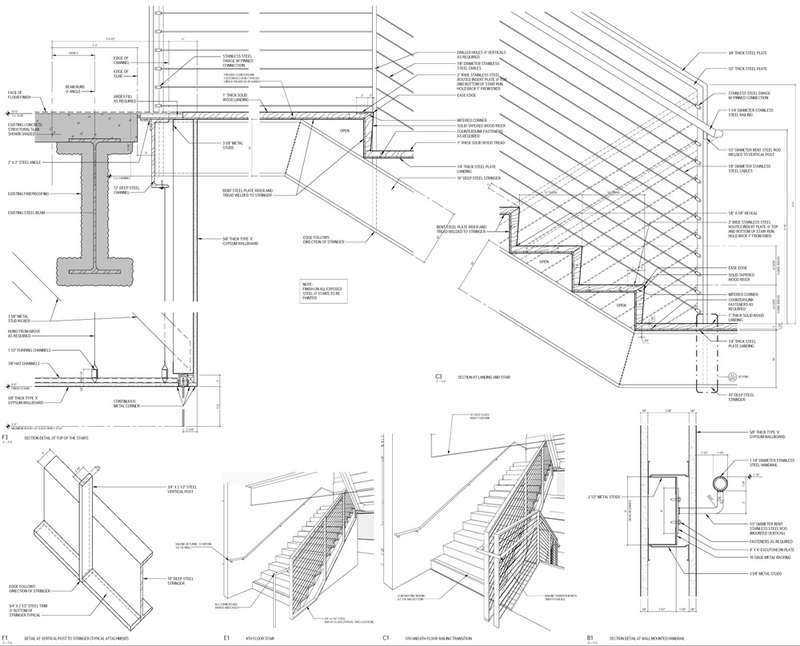 From the beginning of a project to the end, the entire project team focuses on producing quality technical documents resulting in a complete set of drawings and specifications. With the recognition that all tasks are integral to a project’s success, the process is democratized. Intellectual rigour is paired with an understanding that all aspects of architecture, including the technology, design and management, deserve equitable consideration when determining their value to a project’s successful outcome. Conversely, although each member of the team owns a specific aspect of the work, he or she is not expected to possess a complete and comprehensive technical knowledge. The resulting mindset nurtures within each contributor a desire to be both meticulous and inquisitive. Knowledge and informed decisions are an outgrowth of seeking out one’s professional peers and asking questions, checking and rechecking the work of others, as well as one’s own work, and anticipating the implications of code related requirements. 1. All team members are considered valuable assets and are to be treated with respect. 2. Make sure it fits! Coordination of work is of paramount importance. 3. It’s OK to question, even when the issue is outside your particular discipline’s domain. 4. Do the upfront work early, e.g., code and zoning diagrams should demonstrate compliance. 5. A clearly defined vision goes a long way by giving teammates aesthetic direction early. 7. Exceed expectations and deliver comprehensive packages. 8. Recognize the contributions of individuals by rewarding superb work with praise. 9. Meet or exceed deadlines. 10. If it isn’t drawn, it can’t be enforced. HLW implemented a unique quality control regiment to ensure excellence in the architectural documentation process. Tactics are executed early and consistently throughout the project. For example, we analyze code and distribute our findings to team members during the preliminary stages of the design. This establishes the working parameters for moving forward with the documentation process. Similar tools for ensuring early compliance include “Areas of Importance” diagrams and “List of Expectations” memorandums. The former outlines the aesthetic criteria and the latter establishes expectations regarding levels of quality and coordination. Similarly, tactics such as developing preliminary partition typing, door detailing, and door scheduling, provide the project team with a better technical understanding of the building’s requirements at the earliest possible date. We also believe it is just as important to “spot check” at intervals. Subjecting the construction documentation process to random area tests—such as technical and code reviews and Revit clash detection to confirm building system coordination—both verifies the accuracy of the documents and gives a quantitative sense of the quality of the remaining documents. What really constitutes quality construction documentation? We found the answer to be a holistic solution, involving changes in procedures and how we think about the physical documentation of design. The journey originated in a desire to describe the complex workings of the built environment in the simplest way possible. Ultimately, we found technical integration and technical quality to be essential to our practice. A process of reinvention was no less than a dramatic restructuring of the construction document at HLW. The Academy of Motion Picture Arts and Science (AMPAS) project, a 72,000-square-foot, seven-story building with a 1,000-seat theater, located in Beverly Hills, CA, was one of HLW’s initial case studies in implementing a new protocol for quality construction documentation. The project fulfilled a number of stated objectives, including meeting client expectations for the full renovation of an existing facility, minimizing costs, and ensuring effective communication to subcontractors. The construction process, which involved General Contractor Taslimi, was trouble free. This approach provides the General Contractor with an improved understanding of how building components transition. To simplify complexity, the two and three-dimensional details and perspectives of the same components are located adjacent to each other. Please click on the images below for more detail.